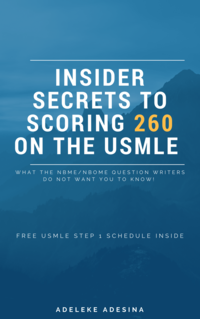 Get a copy of our most popular eBook, "Inside Secrets to Scoring 260 on the USMLE. Discover the proven plan that has helped thousands of students increase their USMLE Score by 30 points. But wait, have you heard about SmashUSMLE review course? The USMLE exam is approaching, but you still don’t have the strength to open your review books? We’ve created an amazing review program just for you! How are we different from other review programs? Fun & easy to understand videos presented by Dr. Adeleke Adesina, Board certified emergency physician and other top USMLE faculty who have scored 245 and above on the boards. The program includes over 250 hours of high yield USMLE Step 1 and Step 2CK review video lectures from First Aid for the USMLE Step 1 and Yale G CrushUSMLE Step 2 CK and Step 3 books. •	4000 + Step 1 and 2 CK high yield questions: Written by top rated USMLE experts from various medical schools. •	USMLE exam interface: We simulated the exact USMLE exam software to prepare you for the boards. •	SmashUSMLE mobile app: download our app and watch video lectures, practice questions anyplace, anywhere. Download our app on Android, and IOS store. I’m interested, but what if I don’t pass? We stand behind our review course and promise to give you a full refund if you do not pass the USMLE® exam or you get a FREE course until you pass the test.